It’s been a bit of a year for me….! Apart from a short visit to see my Sister I am planning to spend my time cooking, eating, sleeping, embroidering, watching Christmas TV and going for the occasional walk. 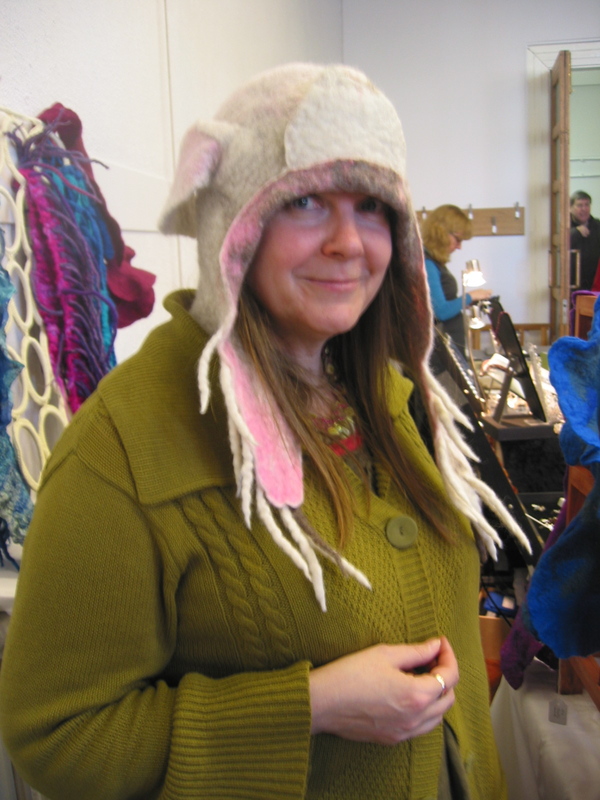 I do have one project planned – to make myself a felted customised pouch / bag to carry round my embroidery equipment in. At the moment it lives mostly in a London Graphic Centre carrier bag – but I have big plans for integral pin cushions, a detachable scissors case etc. Watch this space…. 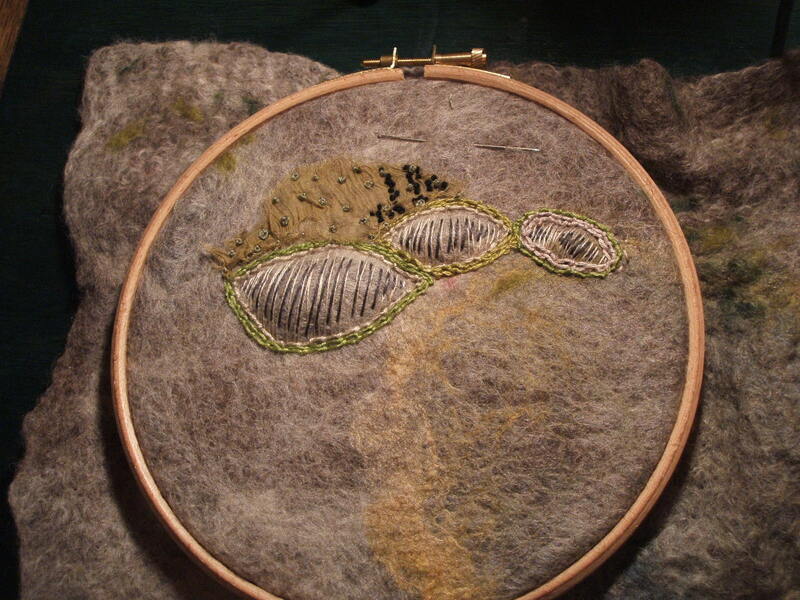 Oh and Isobel taught me how to make needle lace just before my embroidery course broke up for Christmas so I will be working on the ‘lobes’ of fungus to be attached to my current felt based embroidery. 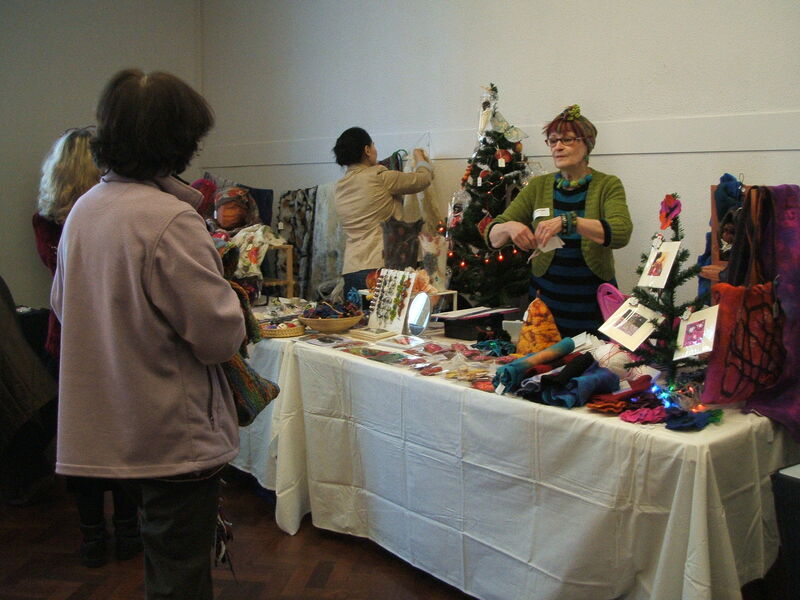 I could have made them in felt but as she said ‘you know how to do that already’…..
And I was doing so well…. At managing to post regularly……..
At least my first embroidery on felt has been progressing more quickly and I.n trying various new techniques. Isobel showed me how to raise part of the embroidery by sewing a patch onto the back of the embroidery – backstitching in a shape from my design and then slitting and stuffing from the back before stitching over the top in two colours. I learnt to do coral stitch for the edges altho I do keep forgetting which way to wind my thread around the needle. I made the suggestion to use silk and applique the green patch. I am now happily french knotting all over it – I do love a french knot….